Nicholas Snider, Steven Weinstein, Kyle Bussard, and Peter Hein at the Kroger donation station. Celebrating the United Nations’ World Food Day to help end hunger, the Ohio University Chapter of the American Meteorological Society and Wealth and Poverty Certificate students together raised 14 boxes of food donations for Good Works Inc., a local charity organization that offers hot meals to Athens’s most underprivileged communities. 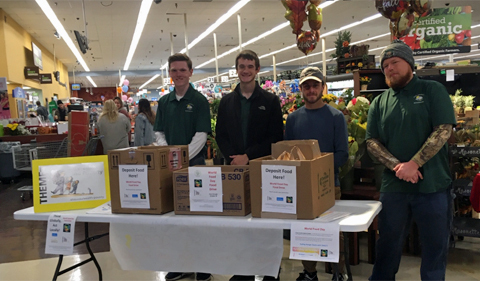 Several students participated in the food collection event at the Kroger on East State Street in the afternoon of Saturday, Oct. 13, while others organized food drives in their apartment buildings and residence halls in the month of October. “Many of my friends happened to be grocery shopping that day, and I was able to solicit donations from them,” said Kyle Bussard, who staffed the food collection table at the Kroger. “It was great,” he continued, “to interact with members of the community who were interested in the food drive. Some people wanted to donate to the food drive but couldn’t afford to. The goal of World Food Day is to end hunger around the world. However, it is important to remember that hunger is a struggle for many people in the local community. I learned a lot from talking with members of the community. We shared views about hunger around the world and within our community.” Bussard ia is a senior in Geography-Geographic Information Science and enrolled in CAS 2300 Themes in Action: Wealth and Poverty. Steven Weinstein, a junior in Geography-Meteorology and the OUCAMS Outreach Chair in 2018-19, orchestrated the collection along with other members of the meteorology club. 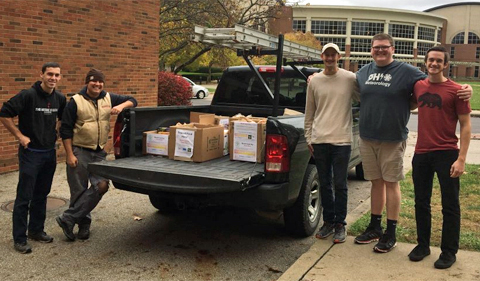 The food boxes were picked up by Doug Schmaltz of Good Works, and OUCAMS students were there again to help upload them. The following two essays are written by those who hosted their own food drive. Food drives are the perfect idea for raising food and awareness for the hungry, impoverished and less fortunate people. There is a huge homeless and impoverished population in the United States. This issue has been going on for decades. So, what can we do to fix or improve this issue? Fund-raise money, hold food drives, soup kitchens and more will all contribute to decreasing homelessness and poverty. After picking up my food drive box, I placed it in the lobby/social room at the Summit apartments. I also placed a flyer near the mail room in order to notify people of the food drive and where to place the canned goods. Many individuals come and go through the lobby every day, which is why I decided it was a good idea to place the food drive box in there. I told many of my friends about this project and most of them donated about one canned good. And every canned good counts. I checked on the box every few days and gradually, canned goods were added. The Summit employees were very supportive and hopeful when I told them about my food drive. They were very kind and contributed as much as they could. They also made it known to residents who came in the lobby. Of course, I donated a few canned goods as well. Even my family members donated canned goods and gave them to me when I was home. I would say that many of my neighbors, family and friends were very generous in donating to the food drive. I learned a lot from this food drive. Many of us take the things we have and own for granted. We do not think about the others who are unable to afford the basic necessities. Especially during the holiday season, people should do what they can to help impoverished communities, if possible. Anyone who is able to contribute to food drives or other projects should not hesitate in doing so because it brings society one step closer to eliminating poverty and homelessness. I think anyone who is interested or uninformed about the wealth and poverty in society should take this class. It is important that we are all aware of impoverished areas. In the United States, it is our duty as a community to help those in need. That being said, this project was definitely a success. 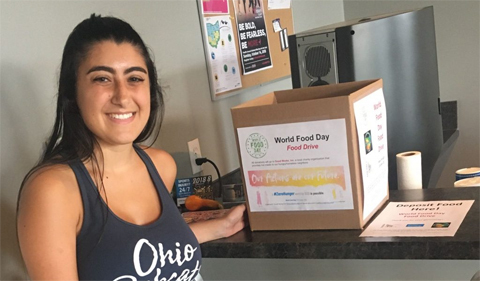 I am so thankful to have been able to help run a food drive for World Food Drive day. I started off by stopping by Dr. Yeong Kim’s office to pick up a box for the donations to be placed in and some fliers to put up to advertise for this food drive. I decided to use my Greek life affiliation to my advantage. I know a lot of the younger girls in my chapter often have extra swipes on their meal plan card and older girls in my chapter often have extra food that they know they won’t use to donate such as extra boxes of pasta or rice or anything like that. Therefore, I placed the box in my living room of the sorority chapter house and sent out a chapter wide message pointing out the fact that there’s a food drive box in the house and that if it is possible for them please stop by and drop off some donations. I checked on the box throughout the week and sent out a couple of reminders. I recognize that being a college student and being affiliated with Greek life is a privilege. Therefore, I took that to my advantage but for the better. I took my privilege as a college student and as a Greek life member to give back. It was such a simple task that a lot of students are able to achieve. This made me realize that it is so easy to take what you have for granted and that every individual should always step back and recognize what they have and take what they have to do something better for someone else. Lastly, recognizing that you are not the only person that can help is important as well. Reaching out to your community, family, and friends can make an even bigger change. If you start people will follow and just like that a little good has been done!